The Emperor Justinian could not decide what to do. His people were rioting. An angry mob poured through the streets, looting, setting fires, and destroying houses and taverns. If they reached the palace, they might kill him. Justinian's trusted advisers pressed him to run to the port and sail away, giving up his throne to save his life. He turned and looked at his wife, the wisest person in the room. What would she, the Empress Theodora, urge him to do? This unabridged reading by Jim Weiss of the book is 26 minutes on one audio CD, giving second-grade readers insight into the life of this 6th century ruler. About the series: The classical curriculum introduces even the youngest student to the pleasures of true learning. Elementary students learn history not through predigested textbooks with multiple-choice answers, but through reading the stories of history. Unfortunately, biographies of great men and women of the past are almost all written for older students, limiting the ability of young students to explore history through reading. Libraries are crammed with biographies written for high school students and adults'"while beginning readers are provided with a shelf full of junior-level books about football players, NASCAR drivers, and movie stars. Now, Peace Hill Press puts real history back into the grasp of the youngest historians with the Who in the WorldBiography Series. The entries in the series provide young readers and their parents and teachers with biographies of great men and women of the Middle Ages. Designed to be used as part of The Story of the Worldcurriculum, these biographies give beginning historians in grades 2'"4 a chance to explore beyond the textbook. The accompanying book is also available separately. 26-minute audio CD: a chronological narrative that tells the story of Theodora, an important, but often forgotten historical figure. 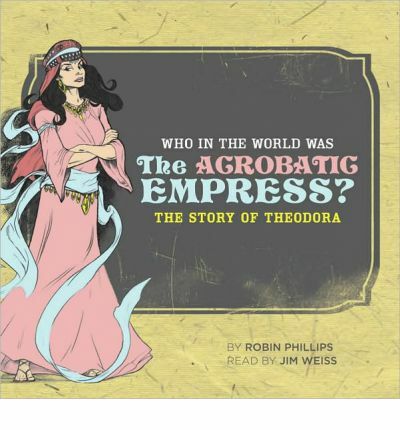 'Discover the intriguing story of Empress Theodora in this unabridged junior-level audio CD of Robin Phillips\'s Who in the World Was The Acrobatic Empress?, read by Jim Weiss.\n' Emperor Justinian could not decide what to do. His people were rioting. An angry mob poured through the streets, looting, setting fires, and destroying houses and taverns. If they reached the palace, they might kill him. Justinian's trusted advisers pressed him to run to the port and sail away, giving up his throne to save his life. He turned and looked at his wife, the wisest person in the room. What would she, the Empress Theodora, urge him to do?This unabridged audiobook CD is a wonderful complement to The Story of the World, Volume 2, and to the Who in the World Was The Acrobatic Actress?paperback book. About the Author: Robin Phillipslives and writes in Rochester, Minnesota.